The perfect photograph deserves the perfect envelope. And protecting your photograph is this envelope's top priority. Our 12 3/4 x 15 Envelopes, also known as photo mailers or cardboard mailers, will guarantee that your photographs, important documents and reports, or gifts will stay flat and remain unfolded. The cardstock material is strong and stiff, making sure that your precious memories stay perfectly pristine. The larger size is great for storing not only for standard pieces of paper but tabloid sizes as well (which is certainly hard to find). You can even send out calendars, brochures, and other business promotions so that you can make sure your customers get the quality items they deserve. 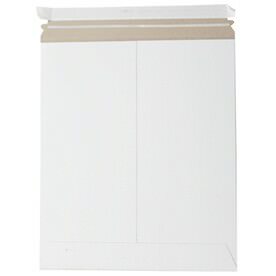 Go for our white 12.75 x 15 envelopes for a very clean look that is easy to label any way you want. 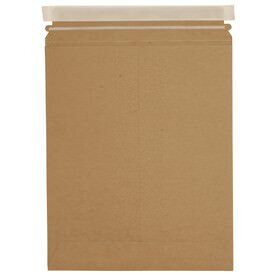 Or try our brown photo mailers for a more natural look, still as sturdy as our white. Each of our cardboard mailers is 100 percent recycled, helping with the safety of your environment as well as helping your documents stay protected. And the self-adhesive strips make it easy for you to close your envelope. All you have to do is peel the strip and seal your envelope; it's that simple! So go strong and go shopping today.